Fig 1: Trees affected by Hurricane Patricia. Image credit: Jose Israel Flores Puerto, with the help of an UAV. Global climate change is considered an emerging threat to the persistence and functioning of dry tropical ecosystems, which are the most threatened of all tropical forest ecosystems worldwide. In the tropical dry forest (TDF) of the Pacific Coast of Mexico, in particular, the average cyclone intensity and the number of very intense category 4 and 5 storms are predicted to increase. Indeed, over a four-year period, hurricanes have landed twice in the Pacific Coast of Mexico, directly impacting the TDF vegetation. Such extreme meteorological events generate further stress to vegetation, which has already been subjected to human disturbance. In the present study, we tested whether the level and type of damage (in stems and tree crowns) inflicted to the TDF vegetation by Hurricane Patricia (category 4, October 2015) is influenced by the previous anthropogenic disturbance of the dry forest. Specifically, we aimed to answer the following questions: (1) how do high-intensity hurricanes affect the TDF vegetation, in terms of damage and recovery, at two habitat types (secondary forest and old-growth forest)? (2) how is vegetation structure and composition related to its damage and recovery capacity? and (3) how do plant functional traits explain species damage and recovery? For this purpose, we first contrasted the vegetation damage and the resprouting ability of the survivors between secondary forests and old-growth forests. Then, we evaluated the potential relationship between vegetation composition and structure (stand-level attributes) and vegetation damage and recovery capacity. Finally, we evaluated the association between biomechanical and leaf functional traits and the vegetation damage and recovery at the species level. In total, we evaluated 3732 individuals of 279 species in eight vegetation plots, four corresponding to old-growth forests (OGF) and four corresponding to secondary forests (SF). In general, the most severe types of damage were biased toward taller trees as they could be more vulnerable to mechanical instability. We found that OGF received a greater proportion of severe types of damage than SF, although tall trees in SF could face a higher mortality. Tall trees would experience a greater mechanical instability caused by strong winds and this would determine a higher probability to be broken. This is especially true when they are emergent trees in a lower height canopy as in the SF, where plants height appear to be more related to severe damages than their basal area. Additionally, as OGF present higher density, as well as trees with greater height and basal area, who are more susceptible to be broken, they can suffer a “domino effect” (Canham, 1978), where the falling trunks can damage the adjacent trees, weakening their roots and opening the canopy. This resulted in higher proportions of trees uprooted, broken, bent, inclined or without branches. Large-sized plants in secondary forests, as well as plants of all sizes in OGF, were able to produce high resprouts numbers/basal area. These findings confirm that resprouting ability is important in forest community dynamics and resilience, particularly after severe disturbance. Resprouting, indeed, involves numerous ecological advantages associated with persistence following disturbances as reestablishment through seed sources can be limited by high rates of seed predation by ants and small rodents, and by physiological limitations to survival. Species with animal-dispersed seeds will also be at a disadvantage, as vectors will not move into large clearings. The species resprouting ability (mean number of resprouts and proportion of individuals resprouting) was also positively associated with the relative chlorophyll content and leaf density but negatively associated with specific leaf area and leaf fresh mass. In this sense, species combining high photosynthetic activity and dense/though leaves would produce a greater number of resprouts. This suggests that after severe disturbances such as high-intensity hurricanes, the regeneration of species with a combined strategy of highly productive and resistant foliar tissues could be favored through resprouting. Synthesizing, both, the old growth and secondary tropical dry forests, are greatly vulnerable to high-intensity hurricanes, as most of their individuals (90% approximately) were damaged. However, the OGF received a greater proportion of severe types of damage mainly due to a greater proportion of taller trees, which are more susceptible to mechanical instability under strong winds, and also can cause a domino effect in the neighboring plants. 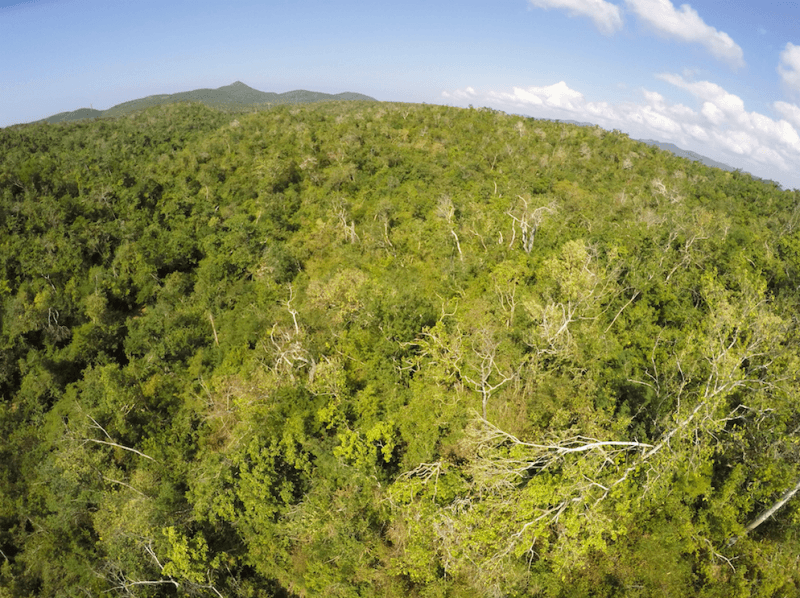 As the secondary forests present a lower proportion of taller trees, the mechanical instability and domino effect are less frequent, and the vegetation suffers less severe damages. However, emergent trees in this habitat could face a higher mortality. Besides, harsh environmental conditions preceding the hurricane could increase the mortality and limit the resprouting ability, especially in SF. With respect to biomechanical and leaf traits at the species level, the species with low wood density and height are more susceptible to suffer damages as “inclined trunk” but also show a greater resprouting ability. A low wood density is also associated with pioneer species strategy that, in the TDF, tend to show small and dense leaves with high photosynthetic capacity. These leaf traits are also related to a greater resprouting ability in our sites, as they enhance resistance (to high temperatures, radiation, and mechanical damage) and productivity. Our findings suggest that in scenarios of increasing frequency and/or intensity of hurricanes in the TDF of the Pacific Coast of Mexico, the OGF, which in the study region is mainly located within a Biosphere Reserve (Fig. 1), could change their physiognomy toward a lower height canopy. A sustained regime of frequent hurricanes could even favor changes in tree architecture (i.e. greater branching), allometric relations and wood quality, that are caused by the mechanical stimulation of the aerial parts (Herrel et al., 2006). Pacific TDF could, therefore, turn more similar to Caribbean TDF, which are more subjected to disturbances caused by hurricanes (Van Bloem et al., 2006). Besides, the proportion of species with lower height and wood density, bearing productive and resistant leaves, could increase, implying a decrease in the proportion of species with greater height and wood density that lack from the capacity of being highly productive under harsh environmental conditions (i.e. late successional species). The floristic change and the simplification of the vegetation structural complexity -which determines the biophysical environment for a large proportion of the species inhabiting this system-, could cause a cascade of negative effects on other groups of organisms, such as animals, potentially leading to the extinction of certain groups in the region. In terms of management, these potential changes could be mitigated by conserving OGF areas widely distributed across the anthropogenic landscapes, instead of conserving just one protected area that can be greatly affected by a meteorological event of high magnitude. This strategy increases the probability that not affected OGF remnants remain in the landscape, acting as a source of propagules, principally regarding late successional species, toward the most affected areas. Finally, as the effectiveness of large reserves largely depend on the size of the disturbance events, the spatial contagion in the disturbance regimes and the dispersal ability of species, the inclusion of other protected areas in the region will favor, to a large extent, the degree of resilience of the entire system at the landscape scale. These findings are described in the article entitled Structural and functional traits predict short term response of tropical dry forests to a high intensity hurricane, recently published in the journal Forest Ecology and Management. This work was conducted by Diana Laura Jimenez-Rodríguez, Mariana Yolotl Alvarez-Añorve, Jose Israel Flores-Puerto, Julieta Benítez-Malvido, Ken Oyama, and Luis Daniel Avila-Cabadilla from the Universidad Nacional Autónoma de México, and Marisela Pineda-Cortes from the Universidad Michoacana de San Nicolás de Hidalgo. Dr. Luis Daniel Ávila Cabadilla is a professor at Universidad Nacional Autónoma de México. His lines of research focus on the responses of Neotropical populations and communities to the anthropic transformation of their habitats. He has conducted research on the regeneration and succession of the dry tropical forest in Mexico, Brazil and Venezuela and has been responsible for programs of protection and management of natural resources in the Protected Areas of the Environmental Services Center of Matanzas, Cuba. Mariana Yólotl Álvarez Añorve is a Biologist and PhD in Sciences from the National Autonomous University of Mexico. He completed a post-doctorate at the University of Minnesota in the Department of Ecology and Evolution in the United States. Her research focuses on the area of ​​tropical ecology, on the study of the response of plants to environmental variations, stress and human disturbance. She is involved, together with collaborators from the University of Alberta (Canada), in the development of novel techniques for the functional study of vegetation, such as the use of remote sensors to characterize the functional status of the arboreal communities in tropical landscapes.